Stylish three bedroom Villa with in walking distance to town and beach. We had a great stay in Port Douglas with the family. The villa is lovely in a nice and quiet complex. Karen and Jeremy were lovely and very helpful. Thanks for staying with us Jacinta, we would love to welcome you back on your next visit to Port Douglas. Fantastic property for 4 adults and 1 child, great to have two bathrooms and next to rainforest. This property is well located to marina and shops. Being in a caldersac it was quiet and peaceful with trees next door. The BBQ area was secluded. Loved the room layout. Only negative was a slight sewer smell from the bathroom. Great Location, great hosts Karen and her husband are wonderful, quiet and clean. the property is a 15 minute walk from downtown and four mile beach. we rented a car in cairns only because it was cheaper to rent a car for the week than pay transport to and from cairns airport. everything was as advertised. the only drawback was the pool. it was very small and had lots of leaves floating on the surface. we spent most of the time at the beach. I like it the place. very cozy and homey. Excellent property, ideal location, kind and helpful owners! Lovely place for a family. Lots of space and all the amenities. Just a short walk to the beach and town. 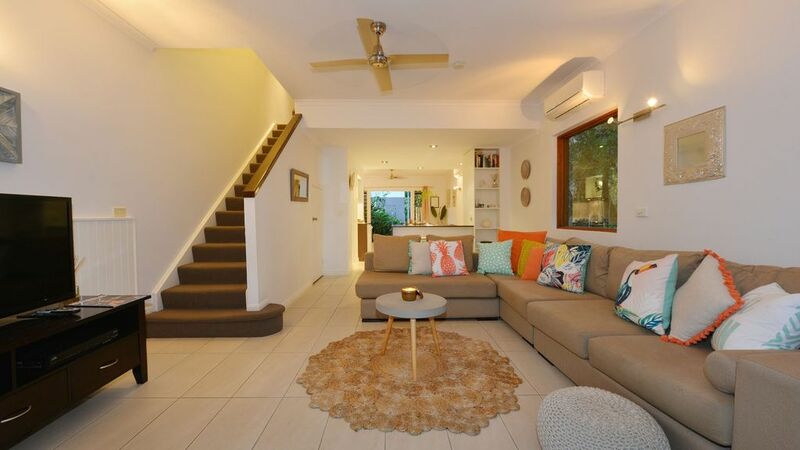 Located just 15 minutes walk from town and 5 minutes from the beautiful "Four Mile Beach" this villa is in an ideal position, with Zipangu Japanese restaurant 100 metres away and Han Court Chinese Restaurant just a little on from that you have great food on your door step. As you make your way into town along Wharf St you will pass the Port Douglas Yacht Club which is situated right on the Dickson Inlet and look back across to the Marina, meals and are served as you take in the great view and enjoy a cold beverage, a bit further on you come across the Port Douglas Marina with Hemmingways Brewery, Barbados, Lure restaurant and Choos Choos Cafe where you can catch the train from. Once in town there are plenty of restaurants and cafes to enjoy, Salsa Bar & Grill is a stand out, the Central & the Court House pubs are great as well, you have to go to the "Tin Shed" and enjoy a cold drink while you take in the best view in Port Douglas, Chillies pizzas is a great spot tables outside in the lawn under the stars coconut bar and great wood fired pizzas. Come and see us at our shop where we can give you the best advice on tours and book them for you.